Tumalo Falls Photos, Bend’s Waterfall! 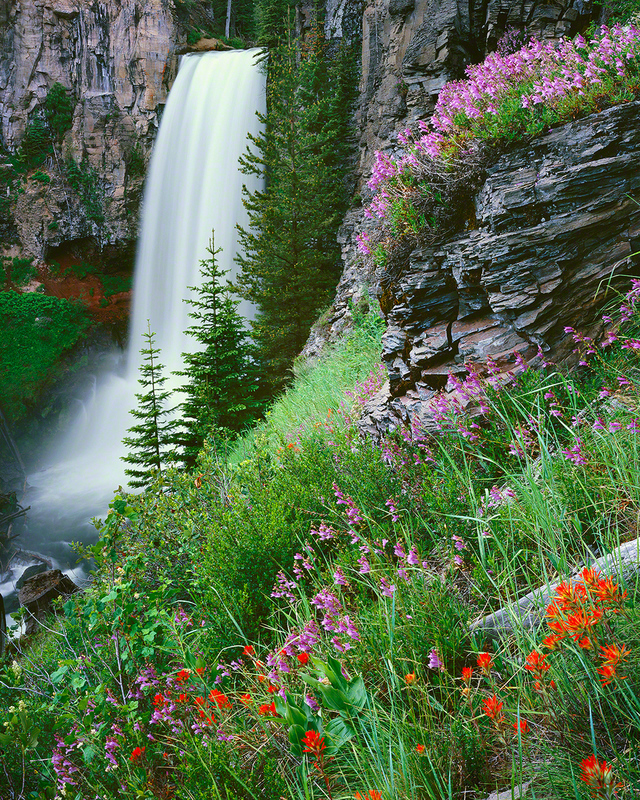 Located just 10 minutes from downtown Bend, Oregon, Tumalo Falls is a short drive from the hub of Central Oregon. In summer months, Tumalo Falls is easily accessible but the parking lot does fill up during summer weekends, so arrive early. The trail which directly parallels Tumalo Creek travels uphill for several miles and passes an astounding array of additional waterfalls. Trail heads abound in the Tumalo Falls area. Do your research ahead of time if you plan to mountain bike or go on extended hikes. Tumalo Falls parking lot, Not accessible in winter! Tumalo Falls, Bend Oregon’s favorite waterfall is a 97 foot tall single drop waterfall on Tumalo Creek, located 10 minutes west of Bend, on Skyliners Road. 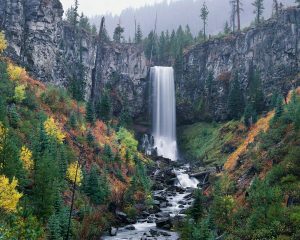 Tumalo Falls and the Skyliners area are one of the recreational areas that makes Bend a phenomenal place for Hiking, Mt. Biking and Cross Country Skiing. In summer, Tumalo Falls bustles with adventurers, eager to explore the easily accessible backcountry areas adjacent to the waterfall. Arrive early if you want to park near the waterfall. Trails depart in every direction but the easiest and most rewarding trail for families directly parallels Tumalo Creek. 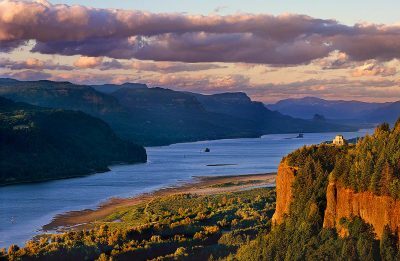 Travel uphill to enjoy 10 additional waterfalls that are found within 3.5 miles of the parking lot. All of the waterfalls in the Tumalo Creek basin are attractive but none more so than Tumalo Falls. 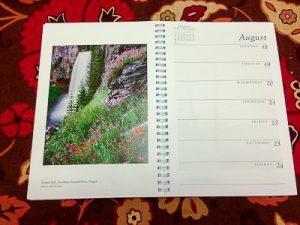 Of all my Tumalo Falls Photos, “Tumalo Falls in Summer” has proven to be the most popular. Seen at right is my Tumalo Falls in Summer image in the esteemed Sierra Club Engagement Calendar. I always enjoy capturing and sharing the beauty of Central Oregon. 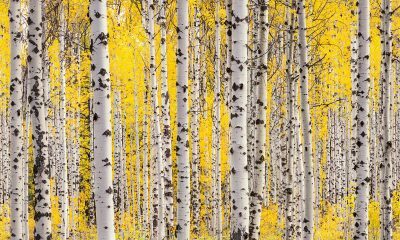 It is an especially big honor to share Central Oregon’s beauty with the millions of people around the world who enjoy the Sierra Club Calendars! 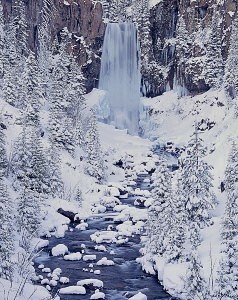 In Winter, Tumalo Falls is not accessible via car. Instead, explorers must make a 2.5 mile journey via skis, or snowshoes to reach the falls. 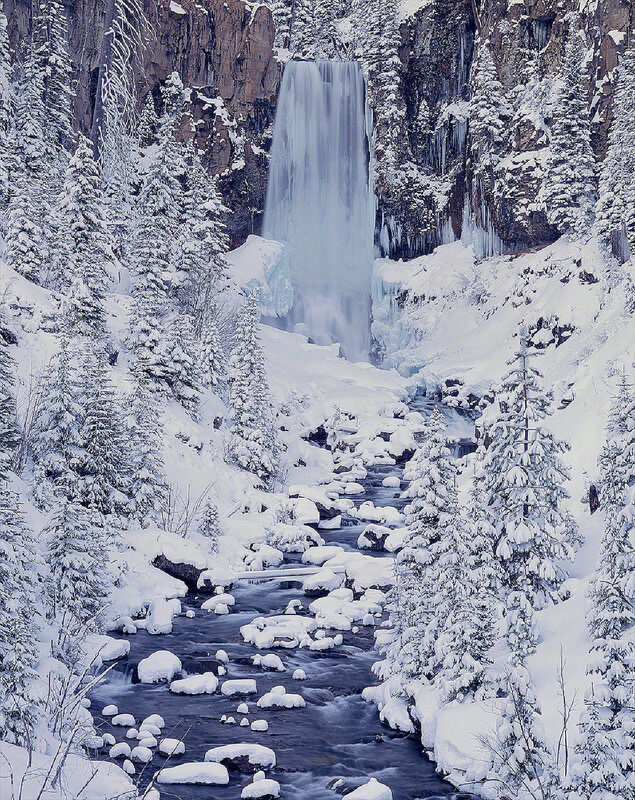 Winter at Tumalo Falls is certainly stunning, especially when there is fresh snow fall. I’ve skied in to Tumalo Falls countless times in winter and this image is the favorite winter image I’ve captured. Just the right amount of snow frosting the surfaces of the scene, make for an elegant fine art landscape photograph. The Trail to Tumalo Falls in winter is one of the few backcountry trails in the Bend area where dogs can roam without leashes. If you are a dog loving cross country skier, This is the trail for you! Winter adventurers should be forewarned that parking at the Tumalo Falls trailhead requires a Snow Park Pass, which can be purchased at various retailers in Bend, such as Powderhouse. 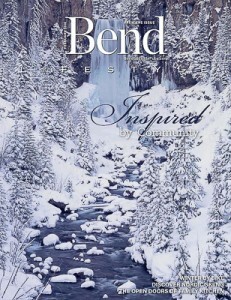 The cover of “Bend Lifestyle” Magazine can be seen to the right. This image of Tumalo Falls, as well as “Tumalo Falls in Autumn” and “Tumalo Fall in Summer’ are all included in my collection of Oregon Greeting Cards. All three of the Tumalo Falls Photos which I offer as fine art prints can be viewed by visiting my Oregon Coast, Rivers, and Waterfalls Gallery. Oregon Waterfall Photos. Autumn in Central Oregon is, in my opinion, the most underrated time of year in our beautiful part of the world. Beautiful Tumalo Falls Photos can be captured any time of year but autumn is definitely my favorite. The following image of Tumalo Falls in Autumn was captured while my wonderful Daughter, Emma, and I were standing in a rain storm on a blustery October day. Tumalo Falls doesn’t have the fall color intensity of some Central Oregon location such as the Metolius River and it’s stunning , sun-kissed Vine Maples or Bend’s Shevlin Park and its golden larch trees. Nonetheless, under the right conditions, Tumalo Falls can have some stunning color in autumn. 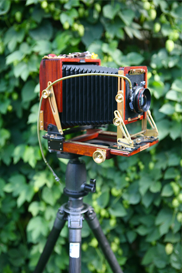 I recommend overcast days with even light, to remove annoying, contrasty light. Wet saturated foliage are also a bonus, so early dewy mornings and rainstorms can be a photographers friend while capturing Tumalo Falls Photos! I have several new Ideas for fine art prints of the Tumalo Falls area, so please check back to my blog often to see my most up to date work.